Green Tomatoes = Chowchow | Does This Font Make Me Look Fat? I had a table full of green tomatoes in the garage after pulling up the tomato plants from my raised beds at the Community Garden. I could have waited for them to ripen (some of them would have) but I needed the table for another project. While sorting through a pile of magazines, I came across a recipe for green tomato Chow Chow. I even had almost all the ingredients in the house. I needed 3 lbs of green tomatoes, so I pulled out my kitchen scale and the amount of tomatoes I had was just a tad over. Perfect. I pulsed them in the Cuisinart, salted them and put them in a colander to drain. 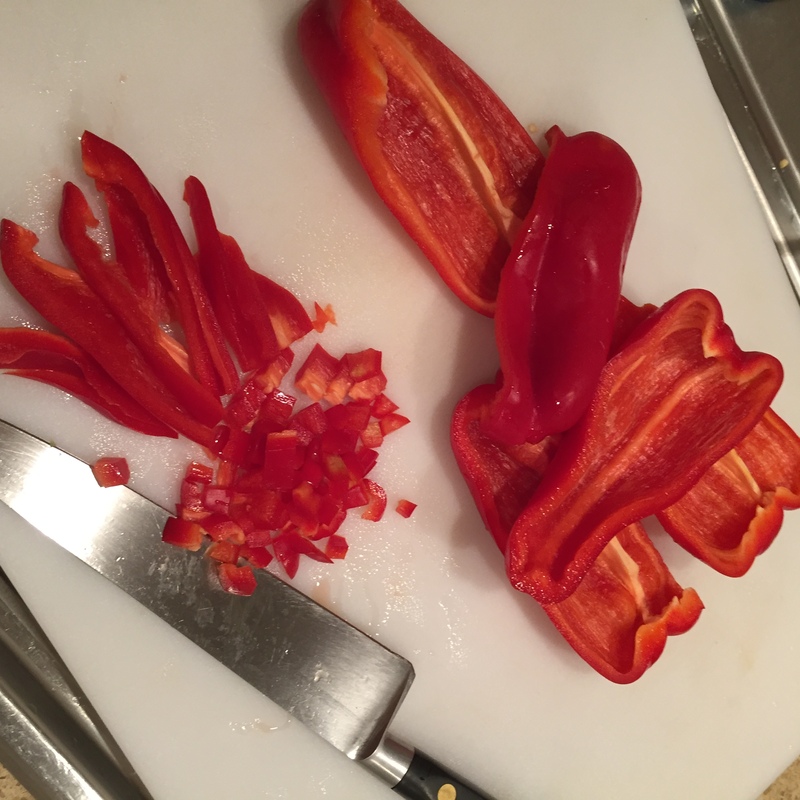 Then 1 hot red pepper from my garden, and two large red bell peppers – the recipe called for a green one which I didn’t use. I like the pop of color the red peppers added. I gathered pickling spices into a piece of cheesecloth, and dumped it all into the biggest stock pot I had. Sugar and vinegar were added and it boiled for an hour and a half. I thought it might be mush after cooking it so long, but it wasn’t. The house smelled wonderful. Towards the end of that boiling, I got my canner on the stove and started heating water. I used my electric kettle to help the process along. I sterilized my lids and tools and was ready to go as soon as the dishwasher stopped. At the end I had seven pints of green tomato chow chow. A pint and a half went into the fridge and it’s delicious. Here’s the recipe if you’re interested. Chop tomatoes. Transfer to a strainer and sprinkle with salt. Let stand for 10 minutes. 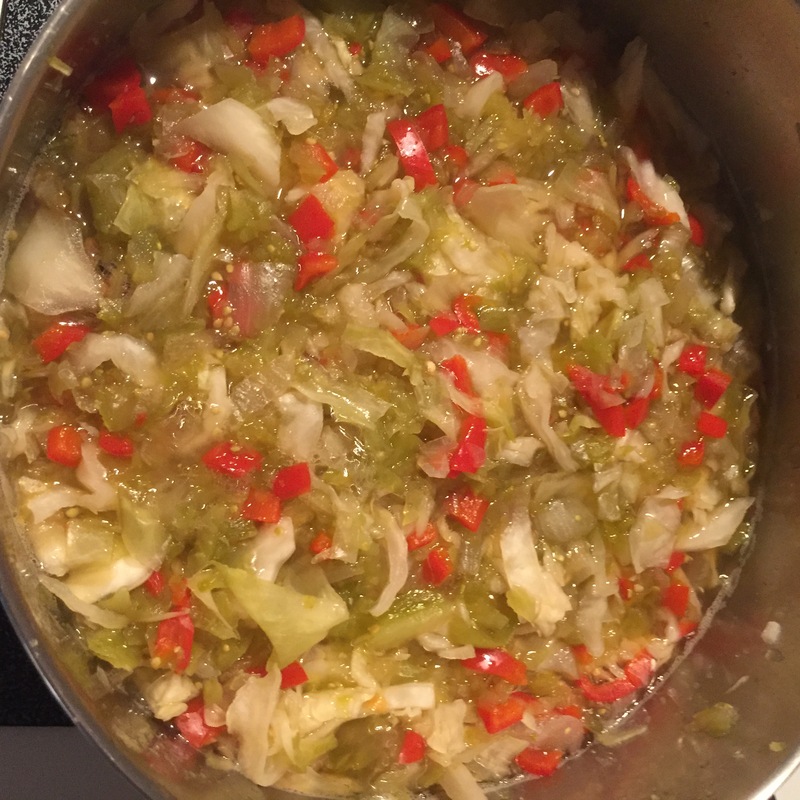 Meanwhile, chop cabbage, onions and red peppers. 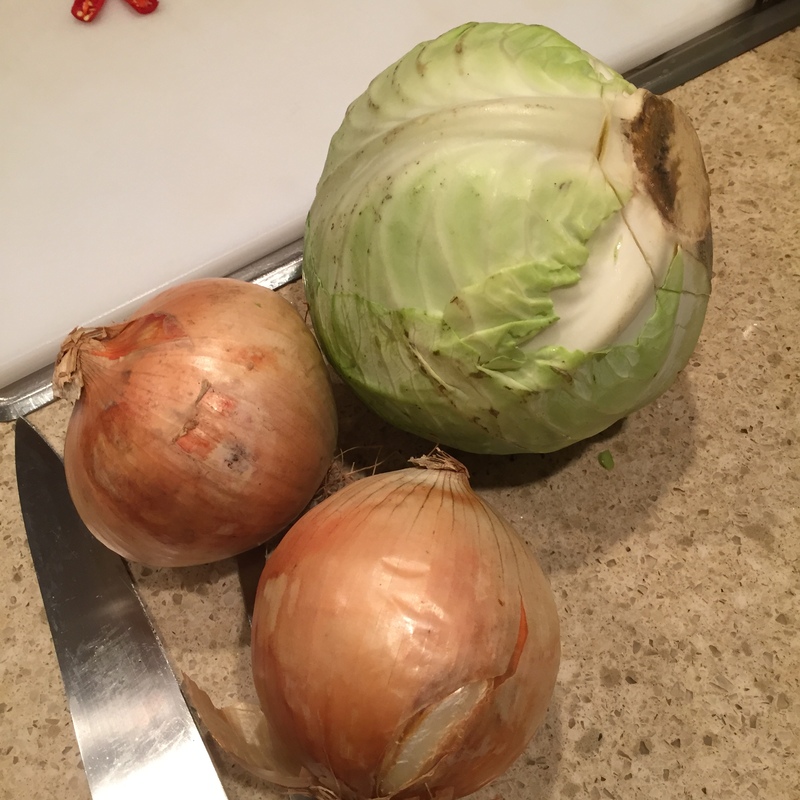 I chopped onions and cabbage separately in the Cuisinart. 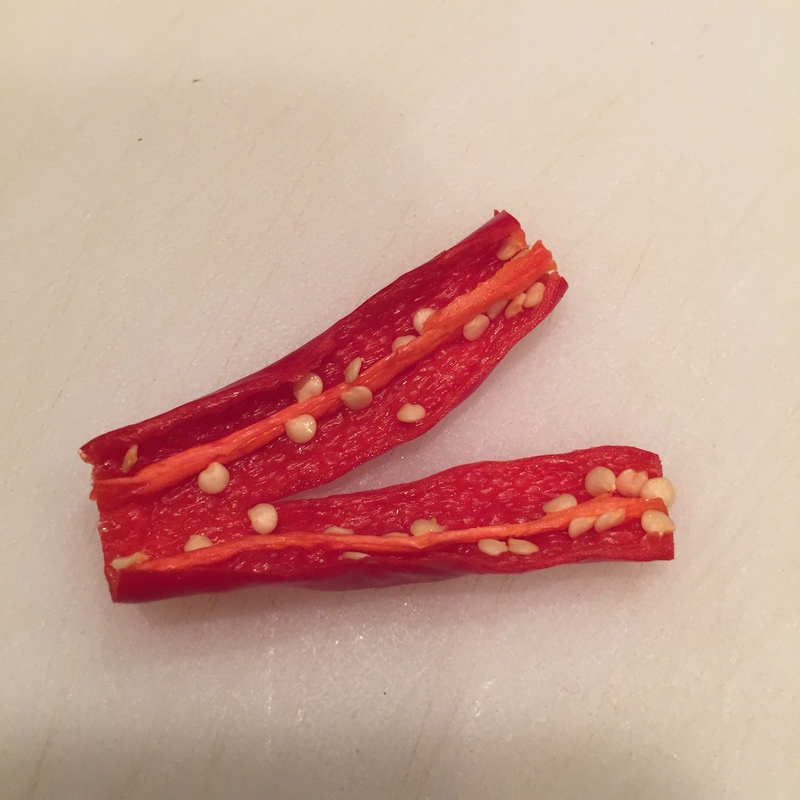 Place in a large pot with drained tomatoes and jalapeno. Stir in vinegar and sugar. 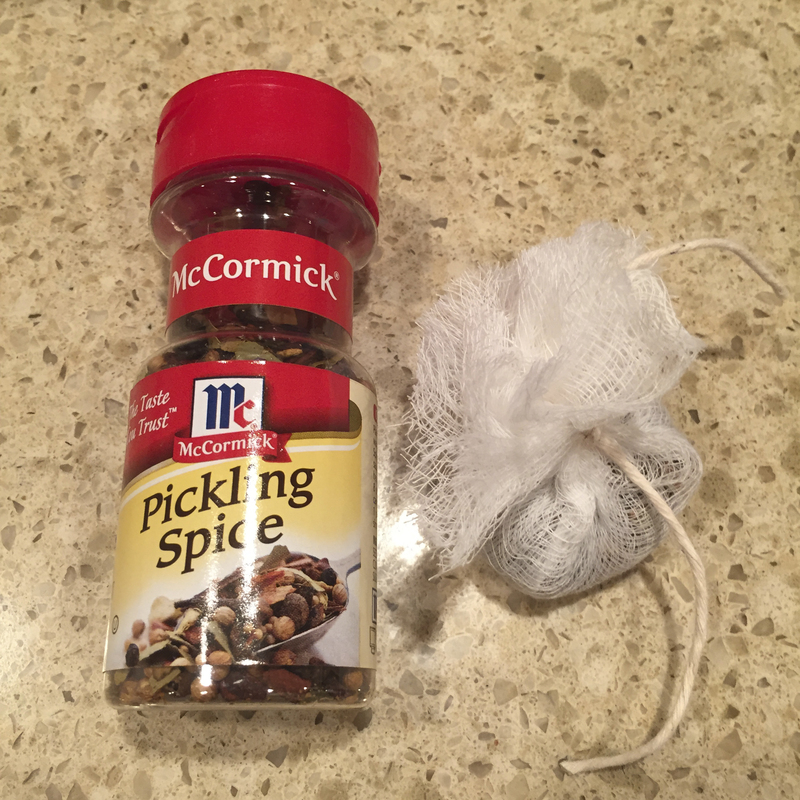 Place pickling spices on a double thickness of cheesecloth. Gather corners to enclose spices, tie securely with string and add to pan. Bring mixture to a boil. Reduce heat; simmer, uncovered until thickened, stirring occasionally, 1 – 1 1/2 hours. Discard the spice bag. The original recipe called for this to be cooled and refrigerated until used. I put my boiling hot mixture in prepared pint jars and processed in a hot water bath canner for 10 minutes. This made 8 pints with a little more. My canner holds 7 jars, so the remainder went into the fridge. This is a delicious accompaniment to all kinds of meat. It had a little warmth from the pepper, which is all I wanted. Oh, I also put a clove of garlic in each of the jars I canned. I haven’t opened any of those yet to see what the garlic does to the flavor. 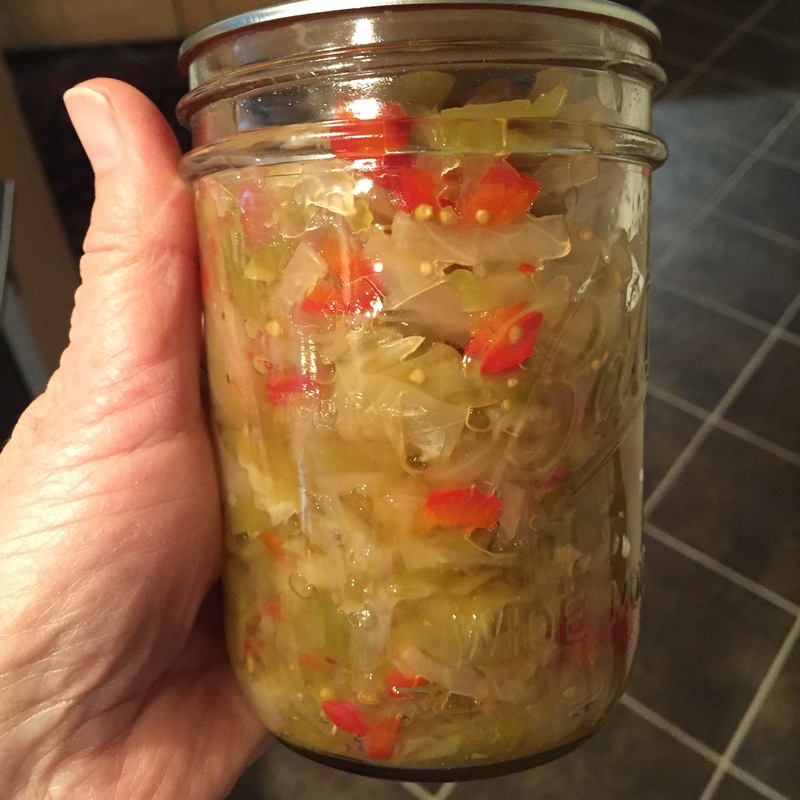 I will definitely make green tomato chowchow again next year. 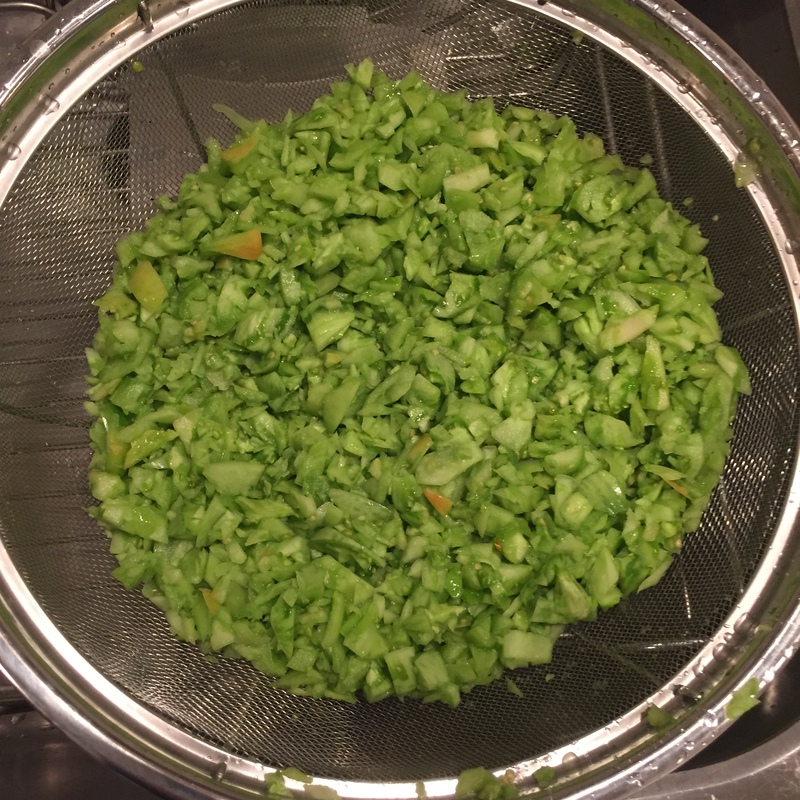 This entry was posted in Canning, chowchow recipe, Cooking, Foodie, Gardening, Putting Food By, Uncategorized and tagged green tomato chowchow, green tomatoes, St. Michaels Community Garden by Mala Burt. Bookmark the permalink.